This is so long ago, but still warms my heart as I remember it. It was the first killing of a faction leader on our server, and one of the first in the world. A feat no-one managed to replicate, even years after our alpha strike. The planning took weeks of effort and a lot of time on my part running around in enemy territory being killed, all in the name of scouting. You know me as Brayloud, the player who organised that event and then later the 40 hunter attempt on Onyxia. I've been quiet of late, not even playing games in the last year....but that's partly because I am now writing my own game. Hello Ivan, or should I say Brayloud! Nice to hear from you, and I love to have your comment to this. I should have known the brain behind the Staghelm kill was also behind the 40 hunters on Onyxia. Epic achievements, those, long before "achievement" was a known word. 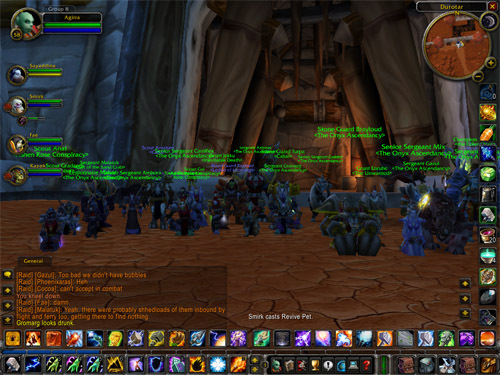 Argent Dawn was an amazing server with a lot of really good guilds. It was a crucible of creativity - and I've not seen the like of the place since. I'm actually working on two games currently. One is set in the stone age and is a simple PVP game. We hope to have this playable within the year. A lot of the graphics and environmental work is done, so the focus is on the programming (my corner) and animations / characters. I'm working with an online virtual indie company on this project. There's no pay but it does provide an excellent environment to learn and progress within a new sector as well as to meet new people who love gaming. The second project will leverage what I learn from the first project and will similarly be built with the CryEngine. This combines story-telling elements with a system that will be designed to allow end players a level of control and story telling of their own that has never been seen before. While RPG will be at the heart of the game I plan to throw out many of the tropes of this genre. Gameplay will be highly focused on much smaller groups, indeed, just a few guilds the size of The Onyx Ascendancy will be the target within each zone. Within each 'realm' I would expect there to be perhaps 8-12 major guilds and a handful of smaller ones - bringing back a community feel to the gaming. I'm dubbing the gamestyle TMO (Tiny Multiplayer Online). Overall gameplay focus will be on sandbox, allowing the players the freedom to determine how they spend their time in the game as well as how much time. The plan is to build a set of toolkits that will allow others to build their own worlds in addition to the one I will build for myself. Once a basic sandbox world has been constructed it will be up to the players as to how it develops from there. They will be free to build their own towns, housing, farms, lumber mills and the like. I'm tossing out the 'Skinner Box' along with it's repellent time sinks and endless meaningless achievements and repeatable daily quests / grind. Gaming has gone from being an enjoyable and creative way to spend some time into an endless grind designed to keep you subscribed in order to bolster a companies end of year financials. The project is huge, and I fully expect it to take the next five years of my life. It will come out in phases, each building on the last - starting with something truly simple, like player housing and a resource management game with no goals other than sculpting the world to your liking. Each player will be able to host their own world and invite their friends to visit and view what they've built. It will be social oriented, not goal oriented. More information is available about my ideas within the wiki I use to gather my thoughts.